The Boudl Al Malaz Hotel Riyadh is located on Al Malaz Ahsa Street- approximately 20 minutes drive from the city center and 45 minutes from Riyadh International Airport. At the Boudl Al Malaz 4-star hotel you will enjoy your stay comfortably. Your visit to the Boudl Al Malaz Hotel will take you into another lavish world full of enjoyment. Boudl Al Malaz is located in a very strategic zone from which you may easily reach any place in the capital. The hotel is distinguished for offering good facilities including a swimming pool and a gym in addition to internet access. Suites consist of either one or two bedrooms and all have two bathrooms- a living room- a small kitchenette- air conditioning- free WIFI Internet access- an iron- an ironing board- a minibar and a TV. 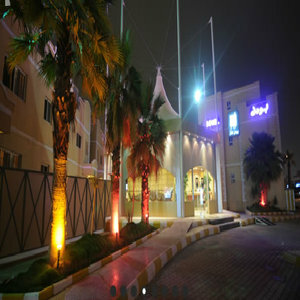 The Boudl Al Malaz Hotel Riyadh is an apartment style hotel that offers basic facility and amenity rooms. Parking is available on-site free of charge. Additional Information: Children age 12 and under stay free in the room with parents and in existing bedding. Children over this age will be considered an adult. Maximum 2 children per room. The hotel reserves the right to without prior notification cancel any reservation with an invalid or incomplete credit card number.